Duration : 2 hour 5 mins. 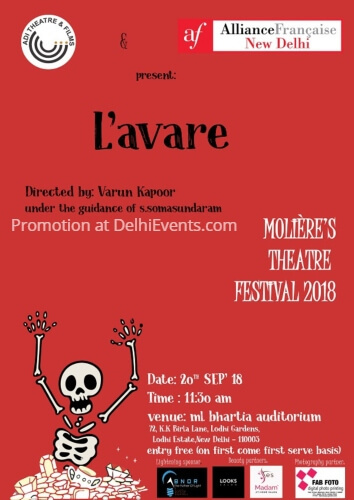 Event Description : Alliance Française de Delhi – Ciné-Club presents "L'avare" French Comedy Film with English subtitles. The plot concerns the classic conflict of love and money. The miser Harpagon wishes his daughter Elise to marry a wealthy old man, Anselme, who will accept her without a dowry, but she loves the penniless Valère. Harpagon himself has set his eye on young, impoverished Mariane, whom his son Cléante also loves. Much of the play’s action focuses on Harpagon’s stinginess.